This document represents the “State of the Practice” with respect to all aspects of accelerated bridge construction (ABC). The intent of this manual is to fill in the gaps left by publication of the previous manuals. This document represents the “State of the Practice” with respect to all aspects of accelerated bridge construction (ABC). The intent of this manual is to fill in the gaps left by publication of the previous manuals. The manual covers ABC techniques, project planning and scoping, implementing ABC in a Transportation Agency, prefabricated elements, long-term performance of prefabricated elements, construction and design. 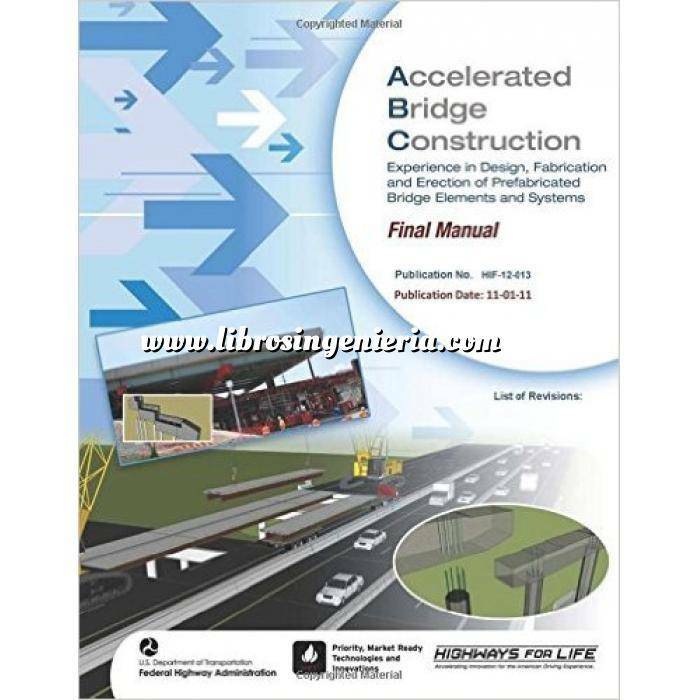 The manual can be used by transportation agencies to establish a successful accelerated bridge construction program. Chapter 1 Introduction WHY ABC?. 1.2. Why use Accelerated Bridge Construction? 1.2.1. Benefits of ABC projects using PBES. 1.2.1.1. Reduced Road User Impacts. 1.2.1.2. Improved Worker and Motorist Safety. 1.2.2.1. Public Response to ABC Projects. Chapter 2 Accelerated Bridge Construction Technologies..
2.1.1. Continuous Flight Auger Piles (CFA). 2.2.2. Accelerated Embankment Preload Techniques. 2.4.3. Horizontal Skidding or Sliding..
2.5.2.3. Continuity of the Construction Process. 2.6.2. Replacement of Existing Bridges and New Bridges. 2.6.3. Effect of Structure Type on ABC Methods. Bridges with Transverse Floor Beams. Chapter 3 PBES for ABC – Planning and Scoping Projects. 3.2. Decision Process for Selection of Appropriate ABC Methods. 3.2.1.4. Right of Way Issues. 3.2.3. Structure Type Selection Analysis Including Overall Project Costs. 4.5. The Role of Innovative Contracting. 4.7. Establish a “Program of Projects”. 4.8. Develop Specifications, Standards, and Standard Details. 5.1.8.3. Coated and Galvanized Bars. 5.3.2.4. Geosynthetic Reinforced Soil Integrated Bridge System (GRS). 6.5.4. Barriers on MSE and Modular Walls. 7.2. Acceleration of Submissions and Reviews. 7.3. Materials Testing on ABC Projects. 7.5.3. The Effect of Tolerances and Adjustability. 7.7.2. Grouting of Post-tensioning Ducts. 8.1. Inspection Preservation, and Maintenance . Chapter 9 Design and Analysis .